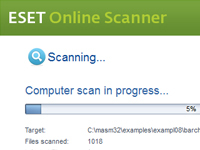 ESET Online Scanner is an easy to use tool that detects and removes malware on your PC. Uses the most current threat signatures, ThreatSense® and anti-rootkit technologies that used also in ESET Smart Security and ESET NOD32 Antivirus. Detects both known and unknown forms of malware, such as viruses, worms, Trojans, phishing and spyware. You can scan whole system, including local and network drives, operating memory, removable media, or you can specify files or folders for quick scanning of suspicious objects. The scanner implemented as an ActiveX control, and requires Internet Explorer 5.0 or later. After every scan an option to uninstall ESET Online Scanner with all its components is provided. It is easy and can be done directly via the graphic user interface by clicking on the corresponding check box and hitting the "uninstall on close" button.